FEATURES: Fuel-Proof, Water Based Formula for Easy Clean-Ups. 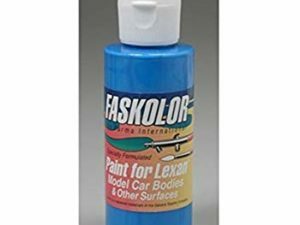 Many Colours for Painting Slot and R/C Car Bodies, Plastic Models. Pinewood Derby Cars, Boats, Scenery, Signs and Ceramics. It remains flexible and resists cracking, chipping and impact damage. Can be used with any air-brush that delivers between 40 and 70 psi, and uses a MEDIUM tip. 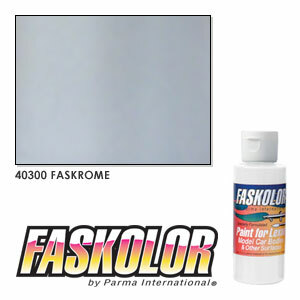 FASKOLOR from Parma is a water-based, non-toxic hobby paint for airbrushing, that is specially formulated for clear polycarbonate (Lexan) surfaces. It actually becomes part of the body when brushed or sprayed on. 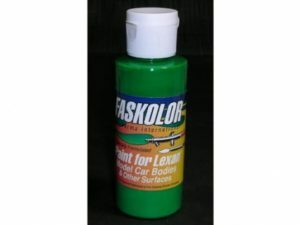 FASKOLOR remains flexible and resists cracking, chipping and most impact damage. 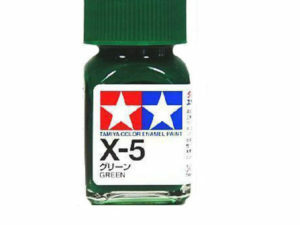 It can be used for any other modelling or hobby project, simply top coat with clear enamel for a gloss finish when complete. FASGLITTER/FASKOAT adds a show stopping metallic finish. They also offer a full line of pre-cut vinyl Paint Mask Designs and FASMASK Liquid Paint Mask for clear bodies and most smooth surfaces for faster custom painting.